Turkish Airlines has been flying international passengers to Istanbul for almost 70 years. Anadolu Jet airline was added to group companies in 2008. Direct and connecting flights are available in 280 destinations worldwide. According to The Economist magazine the airline is world's seventh largest in number of international passengers it carries. KLM, United Airlines and Delta Airlines come eighth, ninth and tenth respectively. Click to see if Turkish Airlines fly from your city. The airline covers 110 countries. Ticket prices offered by Turkish Airlines are usually higher than those of other Turkish passenger airlines - Pegasus Airlines, for example. However, compared to international colleagues, the airline has friendly pricing policy for international routs. Sales and promotions usually start at the end of each year - October-November. You can buy your nicely discounted tickets for travels between November and March. (!) Tickets bought directly from airline's official website have service fee added to the total amount. You are better off purchasing your ticket at agencies which do not have that service fee. www.ekobilet.com, for example, is one of such ticket sellers. 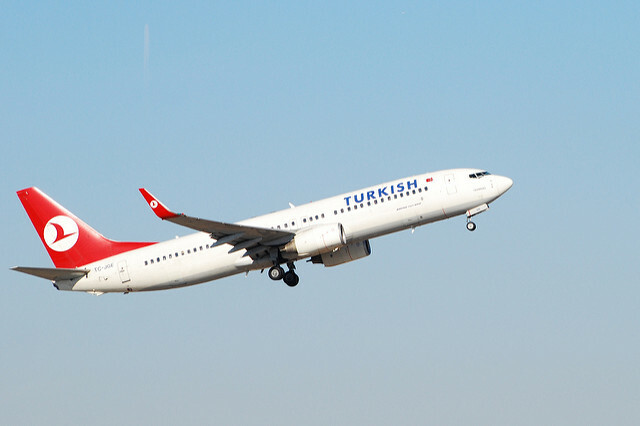 No other airline in Turkey flies to as many destinations worldwide. All connections are done via Istanbul and free city tour and accommodation are available for international transit passengers. Details apply. Miniport baggage handling service is available between Ataturk airport and Taksim area in Istanbul. Only Turkish Airlines ticket holders can benefit from the service. Leave your luggage at Miniport point on the day of travel at least 5 hours before your flight. Continue freely with your plans in the city without the luggage burden. Your luggage will be delivered either to the airport or to your hotel in Taksim (as applies). Pillows and blankets are provided at no additional cost. You get sleeping mask, ear plugs and even lip balm on long flights. Canned baby food is available on board at no prior notice most of the time. Presence in both Istanbul airports - Ataturk International Airport and Sabiha Gokcen Airport. Earning a free ticket with "Miles&Smiles" frequent flier program is rather tricky. If you don't use Turkish Airlines to fly every month (business travelers do), you are not likely to get a free ticket accumulated with your miles. (!) Sign up for "Miles&Smiles" frequent flier program to qualify for ordering Celebration Cake in case you are traveling on your special occasion. "Miles&Smiles" is also a credit card which earns you flying points for every purchase. The credit card serves you good if you reside in Turkey. Food is included in the price of the ticket no matter how short your flight is. You get quality meal even in the economy class. Food choices have a wide range. Vegetarian, different meat choices, fruit plates and more. You can select your own preference online 24 hours before the departure. Special meal selection includes even nut-free options for those who are allergic to nuts. You may get traditional Turkish sweets for a dessert. World cuisine is represented in the meals served in the sky. Food quality receives 6 out of 7 points by world airline raters. Good satisfying reviews prevail over bad however there are passengers who had been taken off the plane due to unpaid extra luggage fees, or allegedly disturbing other passengers. No passenger has won filed complaints or received an apology for crew's behavior. Cases are rare but do take place. (!) If you have a connecting flight (within European Union or USA) and bought liquids in the departure airport, make sure you check-in your purchase and not bring it with you on board. Rules are rules.